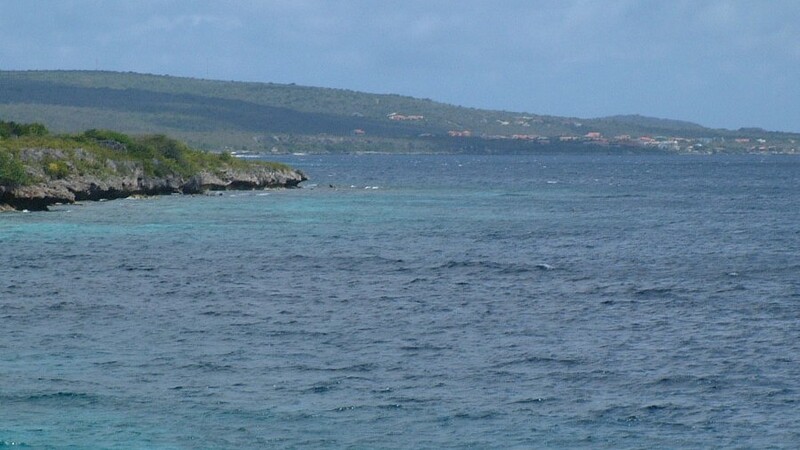 The water around Bonaire is unbelievably clear, and the coral and fish life there is nothing short of fantastic. The locals go a long way to preserving this natural beauty. Cruising boats are not allowed to anchor for fear of anchors destroying the coral. Instead, they must take a $6 mooring. You can have all the firearms on board that you want, but any spear-guns must be given to the customs officer who will return them just before you leave. 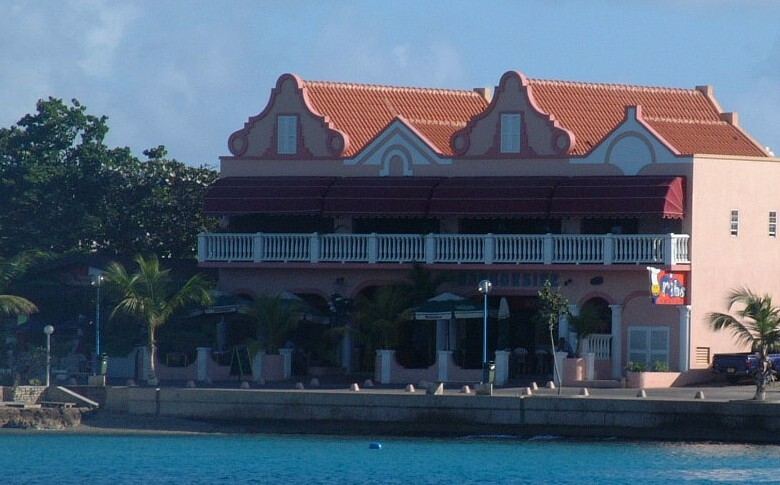 We arrived in Bonaire in early January of 2003 (see the Bonaire Destinations page), about a week before Bill & Mary were to visit. 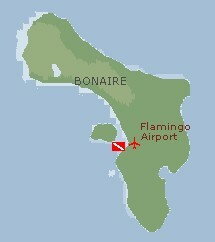 Chris and Amanda had been asking for years to get dive certified, and Bonaire offered that opportunity. For about US$250 each, we could get the 3 of us PADI Open Water certified in only 4 days (Sue got her NAUI certification at Stanford University, one of the hardest courses she ever took there). The dive shop we used was right across the road from the ocean. This meant that not only could we dinghy there in the morning, but all of our practice dives could be done with a minimum of fuss and bother. Just walk across the street and into the water - what could be simpler? We ended up making 3 dives at Cha-Cha-Cha Pier (just across from the dive shop) but our final checkout dive was held further south, just off the airport at a site called Windsock. (Jon) We actually did our first 3 dives here. Cha Cha Cha Pier is right across the road from the dive shop where Chris, Amanda and I did got our PADI dive certifications. This made it very convenient for us. We'd arrive in the morning, usually watch a movie that explained what we had studied the night before, talk to our instructor about any questions, and take a short written exam to make sure we'd got the facts straight. Then we'd get our gear from their storage shed, put it on, check each other out to make sure we'd done it right, and walk across the street and into the water. How convenient! Once our instructor was satisfied that we were comfortable, she would put us through several exercises like removing, replacing, and clearing our mask; buddy breathing; and especially buoyancy control. After that was finished, we always had lots of air left in our tanks, so we'd buddy up and she'd take us on a quick tour of the reef. I'll admit that on these first dives I was a bit overwhelmed. The swimming was fine, of course - we'd done lots of snorkeling. But looking after all the extra gear was very distracting. Constantly checking depth and air pressure remaining, making sure that I was neutrally buoyant at my current depth, making sure my buddy (usually Amanda) was nearby, making sure that her air, etc. was OK, didn't leave much time for enjoying the scenery. I do remember seeing a huge moray eel, and lots of "history" on the bottom in the form of old wreckage and moorings and such. (Chris) Never mind how long I'd wanted to go diving, the first time I swam out over this reef (having just completed the day's training exercise) was an absolutely wonderful experience. It was everything I'd dreamed of, if not exactly what I'd thought (you don't really 'fly' so much as 'float' underwater.) The water was so clear it was hard to believe. I wish we'd had underwater pictures to remind me, as my memories seem almost to good to be true. We did this dive three times, and I can't remember specific events about each dive. However, I do remember that I saw many new things each time, and if I went back now I'm sure I'd see more. 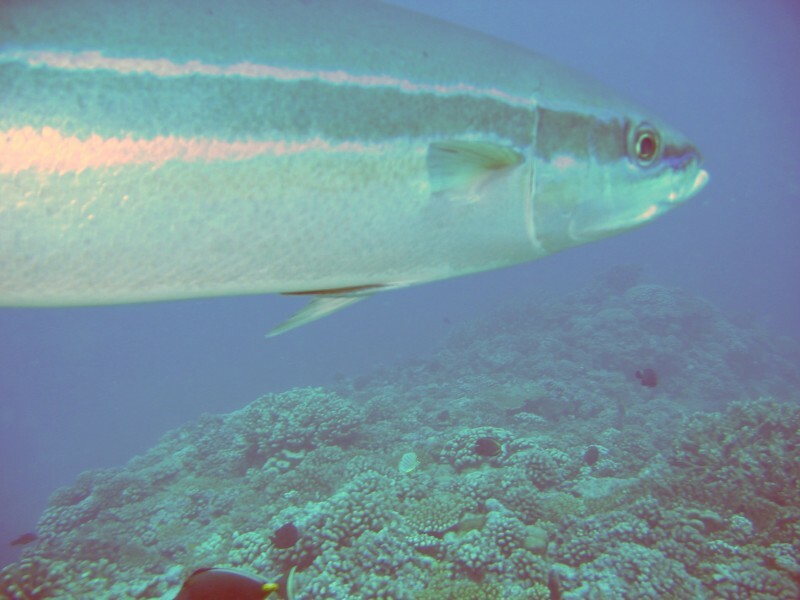 I do remember fish 1-2 feet long, huge eels, schools of completely unconcerned fish, enormous gardens of coral, ancient relics of anchors and such that had been completely enveloped by the reef, and gloriously clear visibility in every direction. (Amanda) It was sooo amazing to be so far underwater, because I usually don't even freedive so far that I have to equalize my ears, and breathing underwater was just very weird, but also very cool. Like what Dad said, it was rather distracting having all the extra gear. For the first ten minutes I was constantly adjusting my buoyancy, and I guess I probably used up a lot of air by over-compensating. But after that I sort of got the hang of it. Bonaire is famous for its diving, and I suppose this reef off of Cha Cha Cha pier was a very good, live one, but I didn't have much time to pay all that much attention to it - added to the fact that it was over a year ago and I didn't keep a very good log of what I saw. There was a moray eel there several times, lots of wrasses and a few other fish I had seen a lot of before. One very striking thing was the astounding visibility. On all three of our dives here, the visibility was around 100 feet. We were down around 60 feet and we could see the hulls of boats floating on the surface as well as the bottom, which was at about 100 feet. I've seen that kind of visibility in other places, but just being in the middle of the water and seeing all that water and all the fish and coral and old moorings all around me... It was pretty cool. (Jon) Windsock was the site of our final "checkout" dive. Since the dive-shop boats were all out at the time, we took our instructor and all our gear in our own dinghy (I love having a nice, big, powerful dinghy!). (Chris) My memory of this dive is that is was the perfect final culmination of our training. First, while I'd love to go back to Cha-Cha-Cha Pier now, at the time we had just done three dives there and it was great to get out somewhere else. My log contains little more than my dad's, except that the conditions were great, which I could have written from memory. My only specific memory setting this dive apart from the others is that we were practicing navigation with a compass, and it seemed a pity that there were so many cool things to see and I had to watch a little dial (not that we practiced over the whole dive.) Like the rest of Bonaire, I really wish I could go back there. (Amanda) This dive was a lot like the ones at the Pier, but slightly more murky. 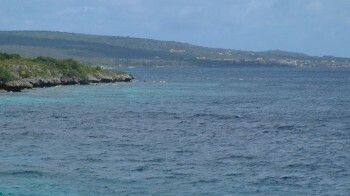 We moored the dinghy in about 30 feet, and descended along a coral wall to about 60-65 feet. Once more, it was amazing how good the coral was here. It was so alive, and so full and so... fishy. It was a wonderful reef, and I got such a charge at just being there, right above the coral, without having to hold my breath or swim to keep under, or anything. It was soooooooooo cool.